If you want to use your gifts and talents, your own experience and you feel ‘the calling’ to uplift women who are ready for a new paradigm! The old paradigm is related to the collective pain body of the feminine- the time has come to step out of it and create a new paradigm where there is room for the feminine to blossom, flow and grow! If you feel this ‘calling’- you are not alone. We, at School of Shakti are pioneering our way into the world. Let the feminine voice be heard and the feminine force find a way into the new paradigm. With this training you have the possiblities to be an assistant/teacher at School of Shakti. WHY: This Training is created for women who (want to) work with sexual energy for the purpose of healing and empowering women and men. How to transmit Love in an unconditional way. We will look at how to transform darkness (addictions, etc) into conscious light and bring your work/life/relationships to the next level. Here you will come home to the Sacred Feminine and prepare your body to contain Shakti Energy. HOW: Through ancient Tantric practise you will learn how to open your body to the Divine. Shakti Tantra initiations and transmissions. 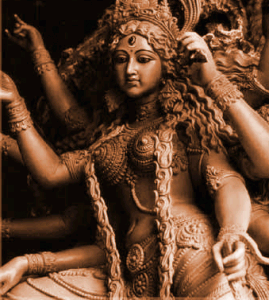 Learn about the most fierce form of Shakti: Kali energy, and get clarification on what this Goddess really represents. You will learn how to move Shakti energy through the body. You will reconnect with the deep longing that will guide you to surrender and trust. Replace will- power with receptivity in your life. Find your own spiritual, sexual practice. Surrendering to the power of Shakti, to life itself, to embracing all aspects of life we become one with the Creation. Throuhg Shakti Tantra we will claim back our connection with sexuality and spirituality. Your body will be in service of the Divine Feminine. You are a servant to the Goddess and a creation of Her. THE ELEMENT ETHER: Reconnect with the ether element, of feeling and channeling your surroundings. Corresponds with Visshudha chacra, the 5th chacra in our energetic system. We have the ability to scan the room or environment where you are in and influence the atmpsphere with a higher frequency. You can feel and hear the ‘unspoken’ and therefor can translate shadow into light. Prepare the body to enter Shakti energy and open yourself sexually as the Divine. You will know the secrets of Devadasi- en Dakini temple practises. Thourought the training you will interact with the masculine in this Stage through tantric meditations with tantric men. You are invited to welcome your own feminine sexual energy as a the valuable source of life-force, wisdom, creativity, sensuality and bliss. To use this as a magic tool to enhance sexual energy within you and your lover. You are encouraged to lovingly face your own shadows, for they are precious guides with meaningful messages. We leren Orakel technieken, hoe je in een tijdloze staat kunt komen waarin verleden en toekomst samenvallen in het nu. Meer Tantric Feminine Secrets worden uit de doeken gedaan, geheimen uit de tradities van de Indiase Devadasi’s, Tempel Godinnen die hun sensualiteit, lichaam en geest ter beschikking stelde aan de Godin/Shakti. Via dans, yoga, meditatie, bodywork, kunst en meer. Het verhogen van je seksuele frequentie en je partner meenemen in deze verhoogde staat van bewustzijn. – How to create altars and prepare a sacred space.